50th Anniversary Book. What a Year It Was Book for 1969 . 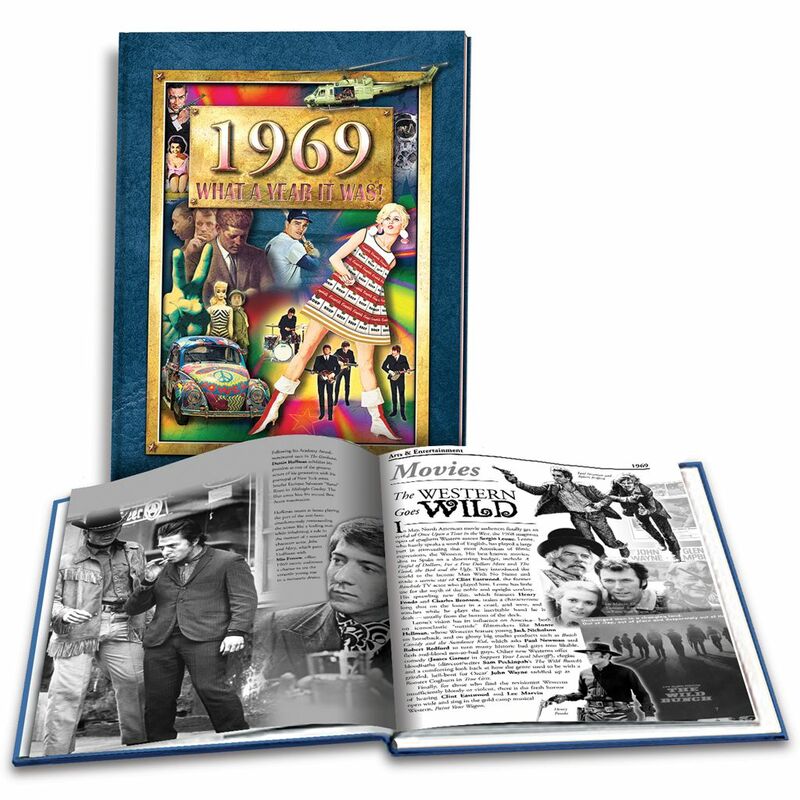 Remember 1969 with this unique collection of original photos, ads from major magazines, grocery prices, salary information, trivia, news headlines, sport events, celebrities, songs and movies. This makes a monumental birthday or anniversary book for the people in your life that are celebrating a monumental occasion! They will delight in remembering what went on in the year they were born or married. You�ll find all this information and more inside this blue hardcover, 170+ black and white paged book. For another $5.00, you can incorporate a 50 character message on a gold seal measuring 2 1/2" in diameter on the cover (see picture). Personalization will NOT delay your order�s shipment. See also our other 50th anniversary gifts. What WE say about our 50th anniversary/birthday book:This book is for one specific year and is a one size fits all gift idea because you can decide to use it for a birthday or a anniversary . The book has the year on it and throughout, but does not mention a specific occasion so it's fine to use for either one. These popular books are not cheap looking- they are regularly given as gifts and are one of the more popular gifts we sell. The option to personalize the book makes it even more special- this is a SeniorStore.com exclusive gift option. No other stores offer the opportunity to let you personalize the book like we do. Even if you decide to personalize it, it will not slow down the processing of your order at all. Give this 50th anniversary book and write something inside the front cover to create your own inscription for them. It's filled with fun facts and a glimpse of earlier days.